Researchers studying potential treatments for pancreatic cancer are working with polymer nanoparticles similar to those shown here. 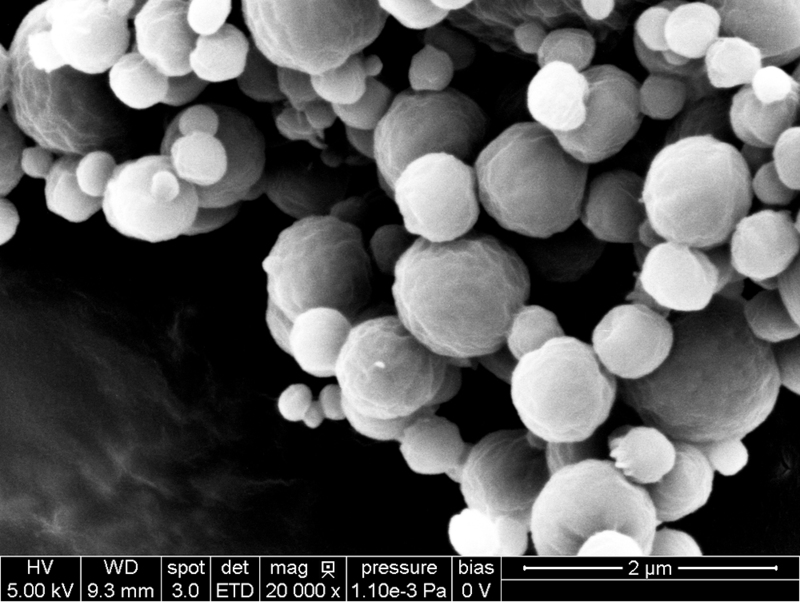 The nanoparticles are tiny, averaging just 300 billionths of a meter in diameter. Larger image. Scanning electron microscope image courtesy of the Nanovaccine Institute. AMES, Iowa – While out mowing his carefully kept lawn during the summer and fall of 2012, a 75-year-old retiree noticed his lower back and side didn’t feel quite right. But it didn’t seem like the normal muscle tweak and spasms. So, when he went in for his annual physical that fall, he mentioned the discomfort to his doctor, who ran some tests and made some referrals. It turned out to be stage 4 pancreatic cancer, already spread to the liver. The family of the former high school teacher and baseball coach quickly learned there really weren’t any home-run treatments after the disease has spread. In this case – with limited chemotherapy treatments – death came six months after diagnosis. Unfortunately, that’s not an unusual story for pancreatic cancer. The National Cancer Institute reports the five-year survival rate for the disease is 8.5 percent. There are no screening tests or early warning signs. So the cancer may have already spread when it’s eventually detected. And when the cancer is advanced, surgery, radiation, chemotherapy or a combination of them are rarely effective. Researchers from Iowa State University, the University of Iowa and the University of Nebraska Medical Center (UNMC) – all of them affiliated with the Nanovaccine Institute based at Iowa State with branches in Iowa City and Omaha, Nebraska – are hoping they can help improve that prognosis. They’re working together to combine strategies, technologies and expertise to develop nanovaccine platforms to combat pancreatic cancer. Their idea is to load fragments of certain proteins associated with pancreatic cancer into nanoparticles that can be introduced into the body. The proteins would arm a patient’s immune system and help it target and kill cancer cells. Nebraska Medical Center (UNMC); John Christiansen, Iowa State University. Balaji Narasimhan, Iowa State; Michael Wannemuehler, Iowa State. Moorthy Ponnusamy, UNMC. Photo by the Nanovaccine Institute. Larger photo. The researchers’ work to study and develop nanovaccines to treat pancreatic cancer is supported by a five-year, $2.67 million grant from the National Cancer Institute of the National Institutes of Health. The project’s leader is Balaji Narasimhan, an Anson Marston Distinguished Professor in Engineering at Iowa State, the Vlasta Klima Balloun Faculty Chair and the director of the Nanovaccine Institute. Other project principal investigators are Maneesh Jain, associate professor of biochemistry and molecular biology at UNMC's College of Medicine; and Salem, the Lyle and Sharon Bighley Endowed Chair and Professor in Pharmaceutical Sciences and the division head of pharmaceutics and translational therapeutics at Iowa. Project co-investigators are Michael Wannemuehler, professor and chair of veterinary microbiology and preventive medicine in Iowa State’s College of Veterinary Medicine and associate director of the Nanovaccine Institute; Surinder Batra, the Stokes-Shackelford Professor and chair of biochemistry and molecular biology at UNMC; and Joyce Solheim, a professor at the Eppley Institute for Research in Cancer and Allied Diseases at UNMC. Batra and Jain have expertise in cancer biology; Narasimhan in nanovaccines; Salem in nanoparticles and cancer; Solheim and Wannemuehler in immunology. That’s what the Nanovaccine Institute is all about – finding seed grants to assemble teams of researchers from multiple disciplines and institutions who work together to launch projects, collect data and make preliminary findings that can lead to major grants and discoveries. Narasimhan has called it a “dream-team” approach to vaccine research. In this case, the biomaterials and nanoparticles researchers are providing a way for the immunologists and cancer specialists to deliver bigger protein fragments to boost the immune system. “This collaboration puts us in a stronger position to explore multidisciplinary approaches for addressing challenges in cancer therapy,” Jain said. First, they’re working with a class of proteins called mucins that are overexpressed in cancer tumors. In the case of pancreatic cancer, the mucin 4 protein (also called MUC4) is overexpressed in 90 percent of tumors, but not in healthy cells. Batra has worked with mucin proteins for nearly 20 years, with some 75 scientific papers related to MUC4 and pancreatic cancer originating from his research group. He’s been working with the Nanovaccine Institute since it was established in 2013 with seed funding from Iowa State’s Presidential Initiative for Interdisciplinary Research. Narasimhan said the nanoparticles developed in his lab, which average 300 billionths of a meter in diameter, can be loaded with fragments of MUC4 with room for other protein fragments as well. The nanovaccines deliver the fragments to lymph nodes where they stimulate the immune system’s T cells to target and attack cells expressing the protein. Why a nanovaccine for that job? “Nanovaccines do a good job activating T cells,” Narasimhan said. Second, Narasimhan said the researchers will look for ways to use nanoparticles to deliver molecules that disable the immune checkpoints pancreatic cancer uses to hide from the immune system. That work is related to the development of various immune checkpoint blockades now being used in cancer immunotherapy. And that could one day lead to powerful treatments. The research project will also test the performance of different kinds of nanoparticles for attacking pancreatic cancer and taking down its checkpoints against the immune system. The nanoparticles produced by Narasimhan’s lab at Iowa State are made from polyanhydrides, a type of biocompatible and biodegradable polymer that slowly releases its payload as it degrades over time. The nanoparticles produced by Salem’s lab at Iowa are often made from a polyester that’s also biocompatible and biodegradable. Salem has also researched using nanovaccines to treat breast cancer, lymphoma and melanoma. He said studies demonstrated nanovaccines can produce a stronger response against cancer. That could one day mean a better cancer story for the more than 50,000 Americans the National Cancer Institute estimates are diagnosed with pancreatic cancer every year – many with disease that has already advanced and spread, all facing a difficult prognosis. From the National Institutes of Health: Research reported in this publication was supported by the National Cancer Institute of the National Institutes of Health under Award Number U01CA213862. The content is solely the responsibility of the authors and does not necessarily represent the official views of the National Institutes of Health. A research team led by Iowa State's Balaji Narasimhan and affiliated with the Nanovcaccine Institute based at Iowa State is studying nanovaccines for treating pancreatic cancer. There are no screening tests or early warning signs for the disease and so the cancer has often spread when it is found. When that's the case, current treatments are rarely effective. The researchers say nanovaccines could generate a response in pancreatic cancer. Their study is supported by a $2.67 million grant from the National Cancer Institute of the National Institutes of Health.